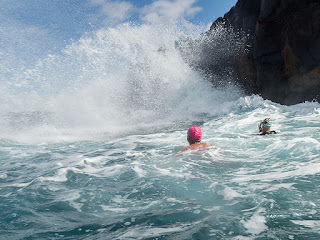 In spite of the occasional big wave set rolling in we had another perfect Maui Pink Cap swim day. We swam from buoy to buoy and explored their various anchors. All were too big to lift, even with everyone trying. 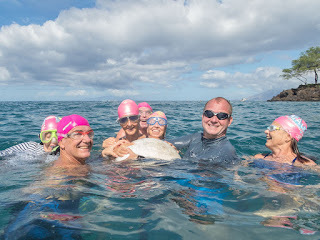 Click HERE for lots more photos of Sunday's ocean swim. HI. This is George's sister, Linda. Thanks for all the great photos.